Preheat the oven to 180°C. Grease a skillet pan suitable for use in the oven or an ovenproof dish with the butter. Beat the eggs. Add the creamstyle sweetcorn and mix through. Sift in the flour and salt. 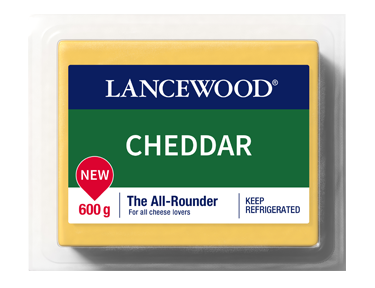 Add the LANCEWOOD® Cheddar and mix well. Spoon into the prepared pan. Sprinkle extra LANCEWOOD® Cheddar over and bake for 45 – 50 minutes until golden and set. Fry 1 chopped red pepper and 3 chopped spring onions in a little butter until soft. Add to sweetcorn mixture. Fry chopped bacon until crispy together with a few fresh sage leaves. Add to the sweetcorn mixture.